In spite of all this, Chennai manages to hit national headlines at least once every decade for intense flooding and it has the deadly combination of civic apathy and official lethargy to blame. While discussing Chennai’s precarious position, Care Earth Trust’s Jayshree Vencatesan emphasises on a pertinent issue--the difference between waterlogging and flooding. She underlines that most places in Chennai are low-lying and given the overall flat topography, water-logging is a common occurrence in the city. In 2005, Chennai faced intense waterlogging with partial flooding. However, 2015 case was a lot different. It was a combination of waterlogging and intense flooding. “Floods build up slowly but recede fast. But what happened in the city last year was just the opposite. With no percolation possibilities (due to increase in built-up area) and the blockage of exit points, the city flooded very quickly,” remarks Jayashree. Despite being categorised as one of Tamil Nadu’s priority wetlands, the Pallikaranai marsh, that supports a remarkable biodiversity, is an object of severe neglect. The marsh, part of a large composite floodplain situated to the south of Chennai, used to stretch from the Indian Institute of Technology, Madras all the way up to Kovalam, almost 35 km away from the city limits. Floodwaters from the south of the city reached the marsh through a complex system of lakes and channels and eventually exited into the Bay of Bengal. While not all parts of the Pallikaranai marsh help in groundwater recharge, it acts as a safe floodplain for the waters to percolate down before draining out into the sea. A survey conducted by Care Earth Trust in the early 2000s revealed that the marsh had shrunk by almost 90 percent--from close to 6000 hectares to barely 600 hectares--over a 50-year period. In addition to this, the changing integrity of the marsh has also contributed to the present situation. 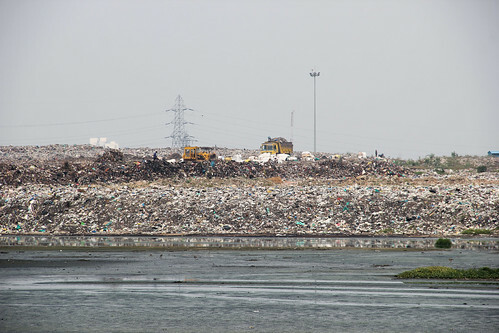 A huge chunk of the marsh is now occupied by the Perungudi dump yard which receives close to 1500 tonnes of solid waste from the south of the city. Misplaced beliefs have led the state to carry out ‘greening’ initiatives where trees were planted all along the marsh--something uncharacteristic of a marsh which essentially consists of reeds, grasses and non-wooded emergent vegetation. Such abuse over the years has greatly limited the marsh’s potential to serve as the city’s flood-proofer as it once had. To the north of Chennai lies the Ennore creek, a once rich tidal wetland with its vast assemblage of associated lagoons, marshes and salt pans. The creek is no ordinary drain; two rivers, the Araniyar from the north and the Kosasthalaiyar from the south empty into the creek. Excess water from the Poondi reservoir ends up in the marsh as well. Despite being classified as a CRZ-IV zone (water body) where reclamation and construction activities are banned by law under the Coastal Regulation Zone notification 2011, infrastructure development has persisted in the area for decades. From the North Chennai Thermal Power Station (NCTPS) to the Kamarajar Port, incessant infrastructure expansion has wreaked havoc to the creek’s delicate balance. Conceived as a satellite to the highly congested Chennai Port, the Kamarajar Port has plans to expand for the third time to accommodate 10 additional berths. A public hearing conducted by the Coastal Resource Centre had found the Kamarajar Port Limited (KPL) guilty of destroying the waterbody and its associated wetlands. “The expansion of the Kamarajar Port requires the conversion of several acres of wetlands into a dry ground to accommodate warehouses and offices. The project is to come up almost entirely on the protected CRZ areas where, legally, no clearance, reclamation or construction activity is allowed. KPL has no proper dredging disposal plan. Though there is no ongoing dumping of dredged soil, the accumulated debris continues to choke the creek,” rues Pooja Kumar of the Coastal Resource Centre. Sandwiched between the NCTPS and the Ennore Thermal Power Station, the creek has been subjected to repeated abuse over the years. Ash pipelines from the NCTPS perennially leak fly ash into the creek, concretising portions of the creek and reducing water flow to a mere trickle along these stretches. Another casualty of such indiscriminate dumping is the Buckingham canal, which is inseparable from the creek in many portions along the Ennore coast. Salt pans, which once dotted the creek’s banks, have given way to solid power plant and port infrastructure. “Multiple salt pans all along the creek functioned as effective shock absorbers mopping up excess water during high tides. 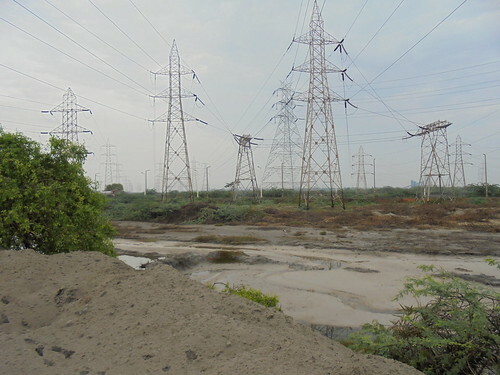 The Vallur Thermal Power Station, the NCTPS and the Kamarajar port have since encroached upon these salt pans, completely decimating the shock-absorption services hitherto provided by them and severely compromising their flood-proofing ability,” informs Pooja. Efforts of the Ennore All Fisher Village Coalition and the Coastal Resource Centre has not all been in vain. KPL has now agreed to remove all the dredged sand it has been dumping in the creek’s salt pans. Currently, 637.7 acres of salt pan lands are in possession of KPL. Though Pooja acknowledges this as a significant victory, she recognises the need to closely monitor the progress to make sure KPL sticks to its promises. Poor understanding of the city’s natural topography and drainage pattern has been a long-standing impediment to competent urban planning. Another serious cause of concern is the archaic management systems followed by the government which allows them to categorise and change the way the land is classified. Removal of encroachments on waterbodies and common lands associated with them is non-negotiable and should be taken up in earnest. “Close to 80 percent of Chennai was wet--with rivers, swamps, creeks and eri poromboke (common lands around waterbodies)--even as late as the 1980s. Shallow systems are supposed to remain shallow and there are several such systems across the city. When you deepen such wetlands, what you are doing is essentially compromising its integrity. Wetlands have been destroyed and rendered useless by the government’s cleaning initiatives launched mindless of their basic character,” rues Jayashree. Wetland systems are often not recognised as critical systems which provide vital ecosystem services. Wetlands play an important role in providing raw materials, food and fresh water, influencing microclimate and moderating extreme events. However, such crucial provisioning and regulatory services are not given their due. “Chennai has been naturally endowed with all these riches but is slowly losing everything to development. River mouths remain blocked and tanks and floodplains vanish by the day. But the biggest concern of all is the sorry state of the Pallikaranai marsh and the Ennore creek, two of the most efficient flood-proofers of the city,” rues Janakarajan. Unless these two crucial systems are maintained at optimal conditions, the dream of a flood-free Chennai can never be realised. Rain rain go away, our cities can't keep the water at bay!